There must be something magnetic about Beachwood BBQ and Brewing. How else could you explain why the Long Beach brewpub attracts so many medals at beer competitions? While LA County’s other breweries did not have a great showing at the World Beer Cup Awards announced the evening of May 3 at the Craft Brewers Conference in Nashville, Beachwood’s co-owner, brewmaster and hophead Julian Shrago brought home the bacon, so to speak, with four medals (three silvers and a bronze)*. And all for dark beers. I guess black beers do matter! Snagging Silver were Beachwood’s Pablo Escobeer (Coffee Beer), Mocha Machine (Coffee Stout or Porter) and Udder Love (Sweet or Cream Stout), while Bronze was awarded to Hoppa Emeritus (American Style Black Ale). “I’m humbled, to say the least,” Shrago texted the Celebrator shortly after his grand slam. Beachwood is a frequent multiple award winner at the WBC and GABF competitions. LA’s only other winning breweries were MacLeod Ale Brewing Co. of Van Nuys, a Silver medal for Van ICE in the Light Lager category, and North Atwater Village’s Golden Road Brewing, the AB InBev wholly-owned pseudo-craft brewery, that struck Gold in the Fruit Wheat Beer category for Mango Cart. (Interestingly, several of AB InBev’s “High End” stable of formerly independent craft breweries medaled at the WBC.) 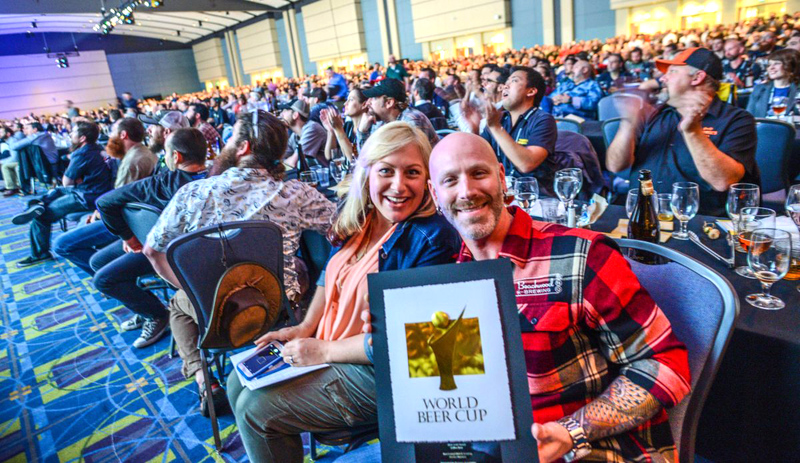 See worldbeercup.org/winners/ for the complete list of 2018 World Beer Cup winners. While local breweries did not fare so well at the World Beer Cup (aside from Beachwood, of course), Los Angeles’ breweries kicked some beer booty in the recently announced results of the Los Angeles International Beer Competition, with a total of 43 wins spread over 22 separate breweries — a marked increase over the 27 wins reported last year. See fairplex.com/competitions/beer-competition for the complete list of Los Angeles International Beer Competition winners. On the heels of the LAIBC results, the San Diego International Beer Competition announced its top brews, with LA breweries capturing 28 of the medals. The big winner of the whole competition was (surprise) Beachwood BBQ & Brewing, which won six medals (three Gold, two Silver, one Bronze), and was named 2018 Champion Brewery. In addition, sister outlets Beachwood Blendery, also in Long Beach, and Beachwood Brewing in neighboring Orange County took home a medal each. See sandiegobeerfestival.com/beer-competition/winners for the complete list of San Diego International Beer Competition winners. Congratulations to all the winning LA breweries! Award-winning beer writer Tomm Carroll was shortlisted for a British Guild of Beer Writers Award in 2018. He will travel to just about anywhere to drink, judge, and write about good beer. Contact him at beerscribe@earthlink.net.